At the same time that Mom and I found her gorgeous Frenchie dresser, we got a set of side tables to go along with it! Actually, it was an entire bedroom set of a dresser with mirror, a tall dresser, and set of side tables. The low dresser was transformed into kitchen storage. You can check out that transformation here. Our next project from the group was the side tables. These were going to live in the family/TV room. My Mom has the same struggles we all do in that room. There is no storage for remotes, a book, or the pocketfuls of keys my Dad deposits whenever he gets home from work. 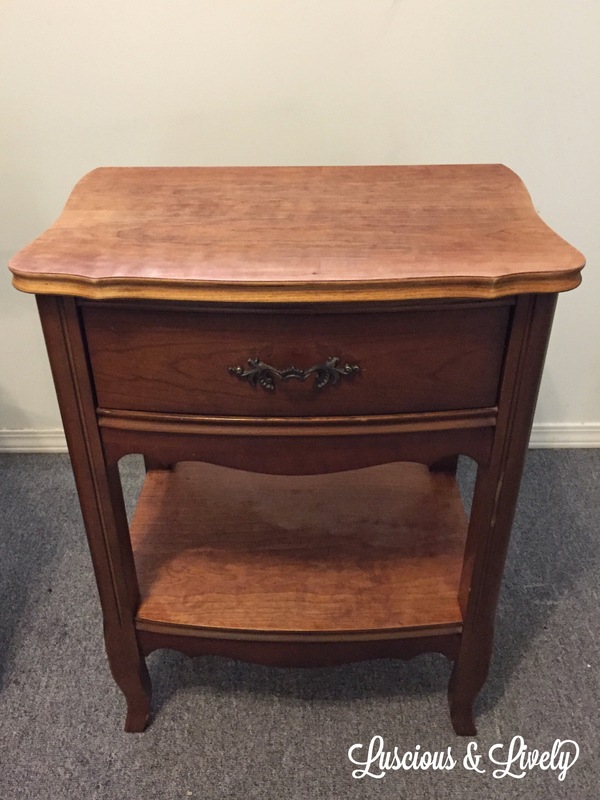 Enter side tables with generous drawers. 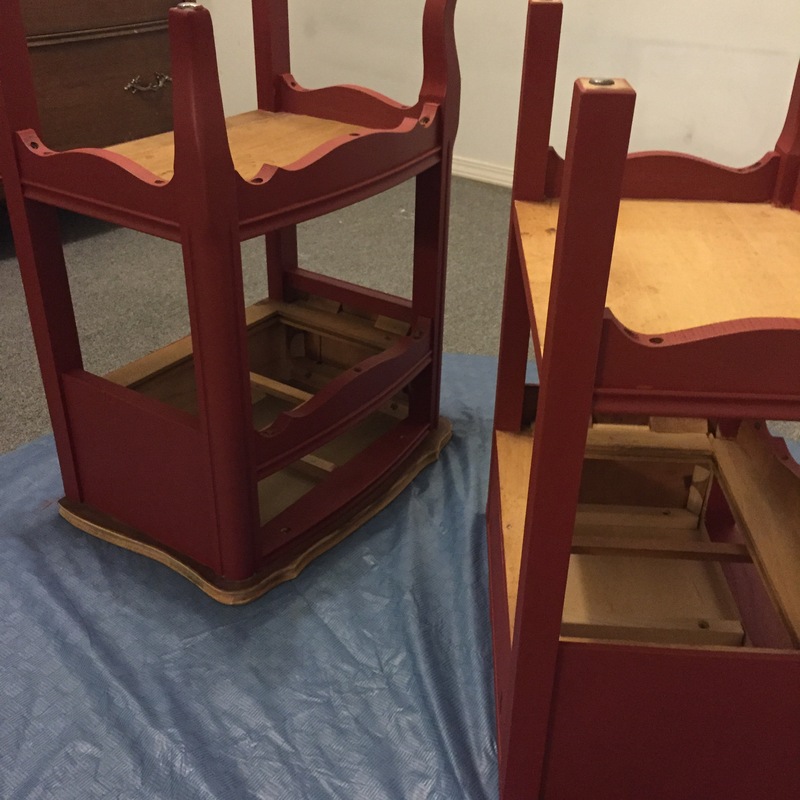 Our first order of business was stripping all of the old finish and stain on the tops and the bottom shelf. 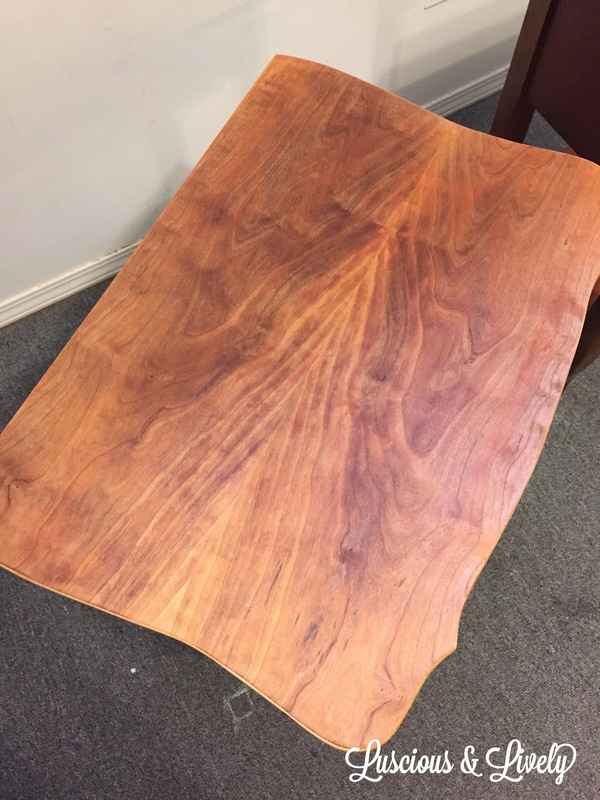 My Mom loved the result of the stained top on the kitchen dresser, so we did the same finish here, with Minwax Dark Walnut and Fusion Tough Coat to seal. Plus who wants to hide that delicious grain! 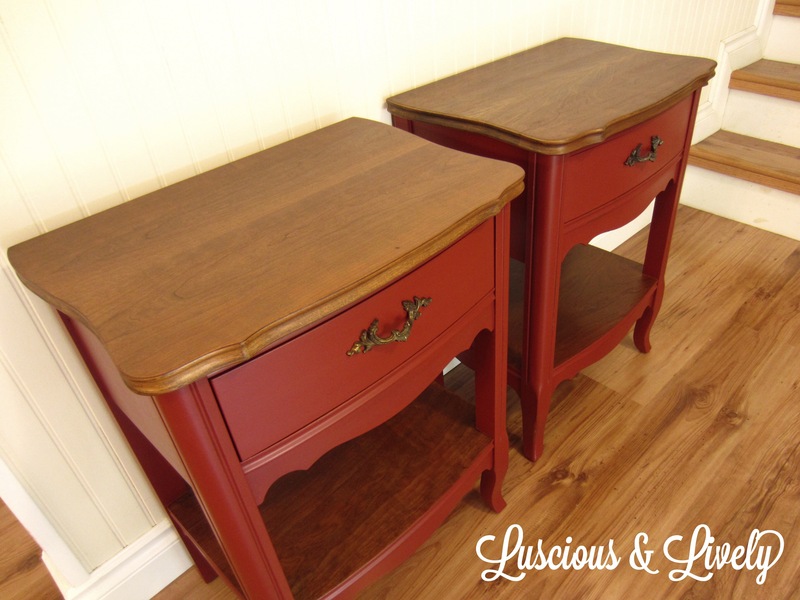 We painted the rest of the tables with Homestead House Milk Paint in Barn Red. This colour is a beautiful deep red, like an aged, well, barn. It isn’t too bright or loud. It was the perfect colour for an accent piece in the family room. We mixed our first coat with the Bonding Agent, this helps the milk paint to adhere to the surface. Always make sure to prep the surface! Sanding it helps the paint bond even better. If you don’t use the Bonding Agent, you will get a very chippy finish -awesome if that is what you are wanting! 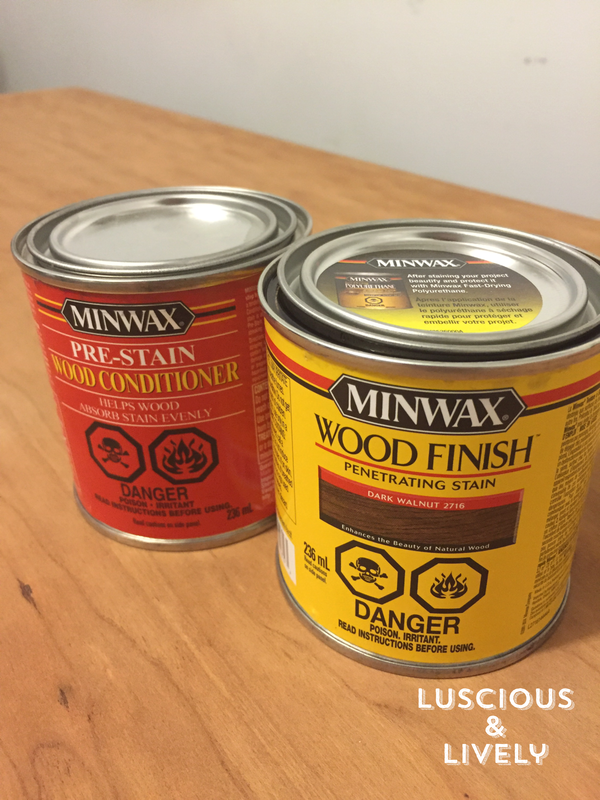 If your wood is unfinished you won’t need the Bonding Agent, but it is a must-have on a glossy surface like this! When painting picky angles, upside-down is usually easiest! Also, ugly table cloths protect carpet! 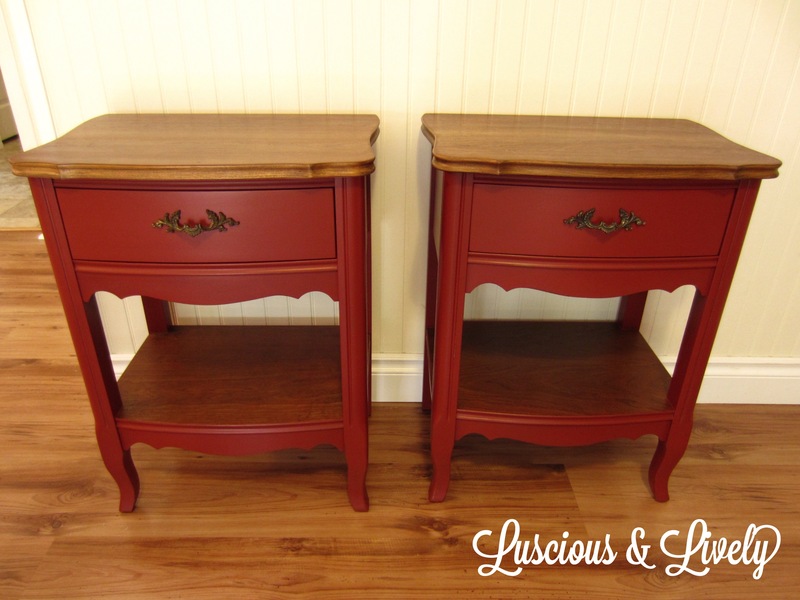 The end result is a pair of gorgeous side tables. The milk paint went on very smoothly. It does take a bit of learning. Milk paint is mixed with water, so you want to be sure to follow the directions to get the right consistency. I lightly distressed the details and edges of the tables, to give them a bit more of a “lived in” look. 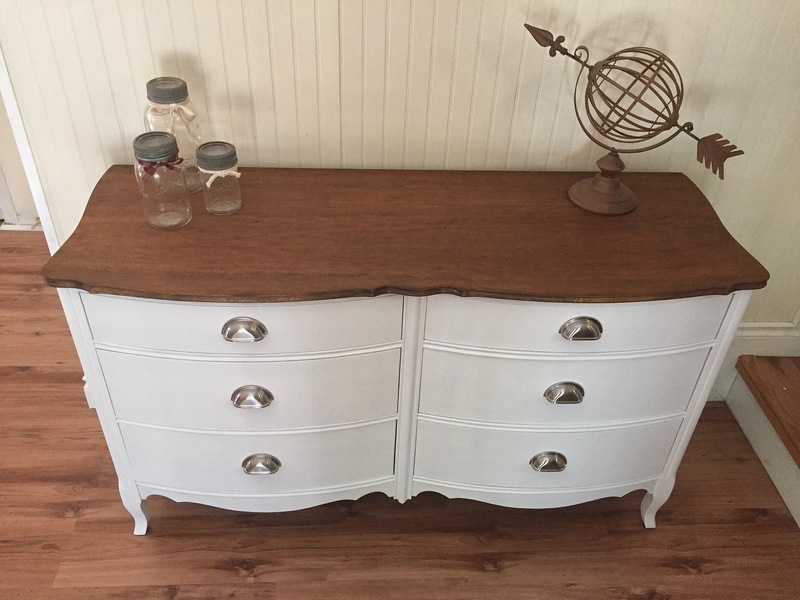 I am so happy with the end result, and I can’t wait to use milk paint again. What do you think? Do you love the Barn Red? 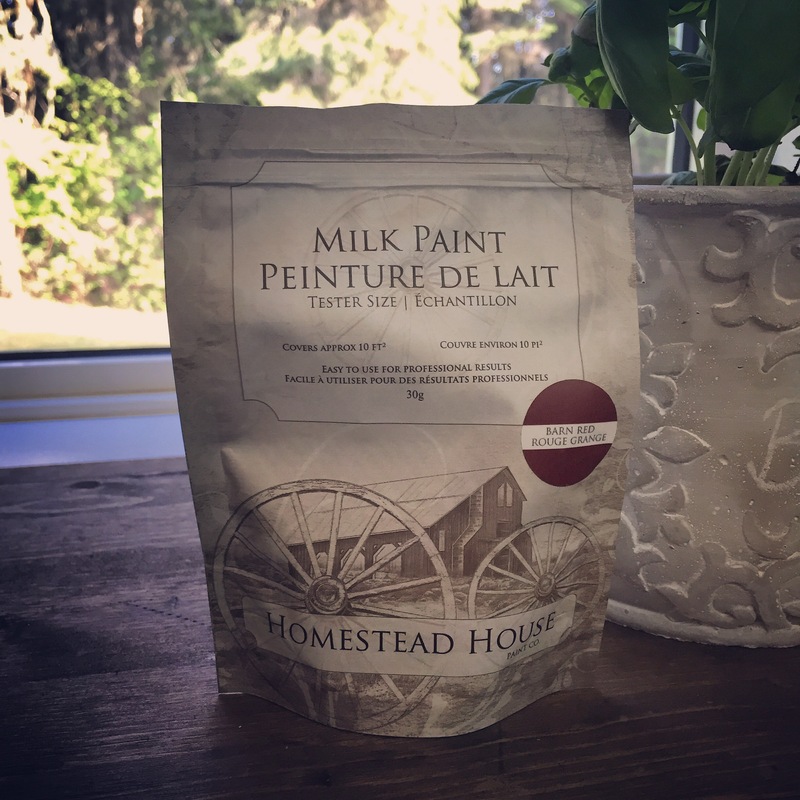 Let me know if you have used milk paint on a project, and how it turned out! It was a great project to do with you Aubrey! We are super pleased with how great these look in the family/TV room and those drawers absolutely are very much appreciated! The Barn Red colour was exactly what I wanted it to be. Two thumbs up for this paint!! I thought I would mention that I really liked using the Natura Paint Stripper – so easy and did not smell. Now to get going at the high dresser…and a few other things “kicking” around the house!